Today is my turn on the Bonnie Christine Ribbon Blog Tour. 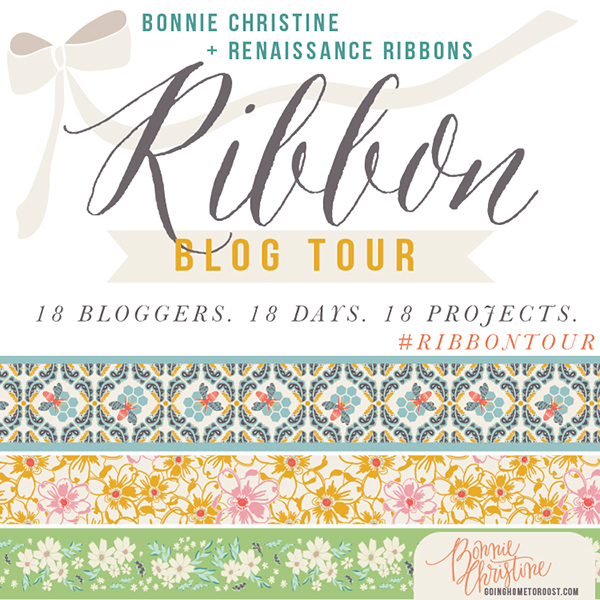 I am honored to be a part of the blog tour that celebrates the launch of Bonnie Christine’s ribbon line with Renaissance Ribbons. 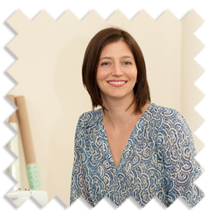 Bonnie Christine is a surface pattern designer and author of Going home To Roost – A blog dedicated to living an extraordinary life. If you haven’t visited her blog or Instagram page.. Make it a first on your to-do list.. She is one inspiring lady! 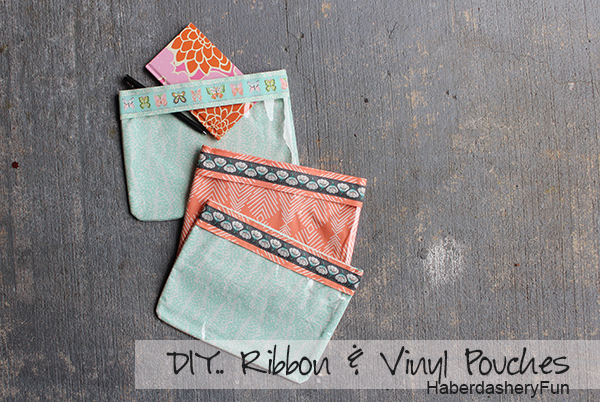 Today I’m sharing my project that was designed using her ribbon and fabric. I have to admit, the fabric and ribbon were so gorgeous that I had a hard cutting them up. I love sewing with clear vinyl and have wanted to make see-thru makeup cases for my travels. 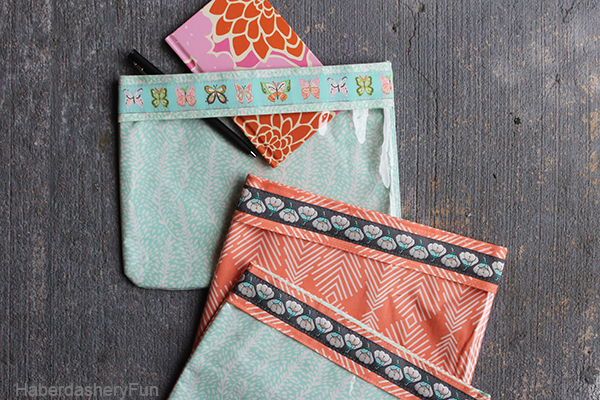 I travel A LOT and always need extra pouches for my travel gear, makeup, receipts, loose change and bills… I thought this blog tour was the perfect opportunity to make a few, plus it was a chance to play around with Bonnie’s awesome colors and prints. 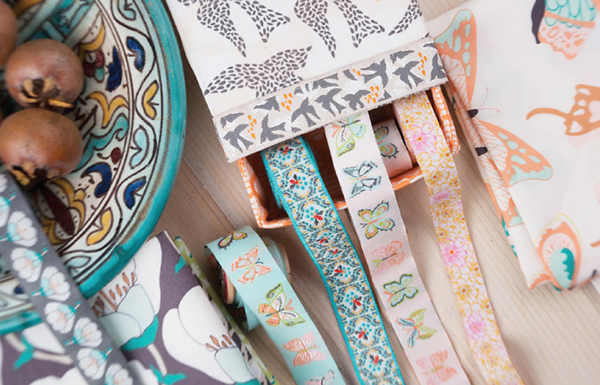 Note – Bonnie Christine fabric is made by Art Gallery Fabrics and the collection I made my pouches from is called “Winged”. You can find her ribbons over at Renaissance Ribbons. Cotton fabric #1 for the back piece – Cut 1 rectangle measuring 10″W x 8″L. Cotton fabric #2 for the lining piece – Cut 1 rectangle measuring 10″W x 8″L. Cotton fabric #1 or #1 – Top and facing piece – Cut 2 rectangles measuring 10″W x 2 1/2″L. Clear Vinyl – Cut 1 rectangle measuring 10″W x 7 1/2″L. Interfacing – Cut 2 rectangles measuring 10″W x 8″L. Depending on the weight of your fabric, use this for the back and lining pieces. Ribbon – Cut 2 pieces 10″ in length. Velcro Tape – Cut 1 piece 10″ in length. 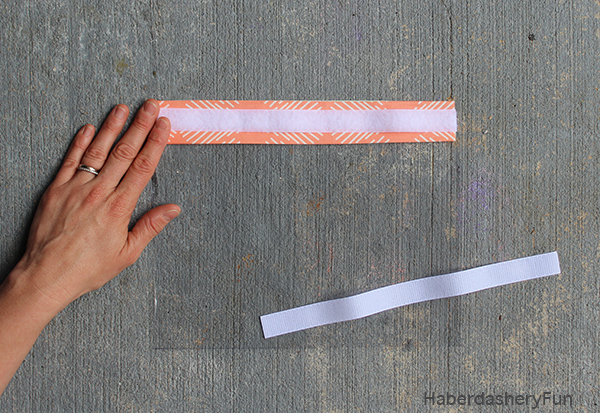 Step 1: Lay the 2 rectangles measuring 10″W x 2 1/2″L on your work space. 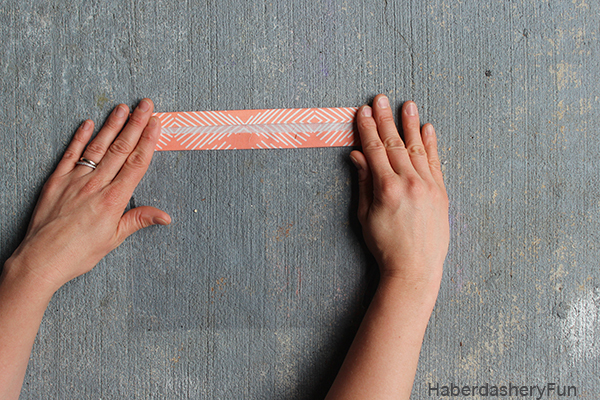 For both rectangles, turn the long side of the top and bottom edges under 1/2″. Place 1 piece along the 10″ side of the clear vinyl. The folded edge should cover the edge of the clear vinyl. 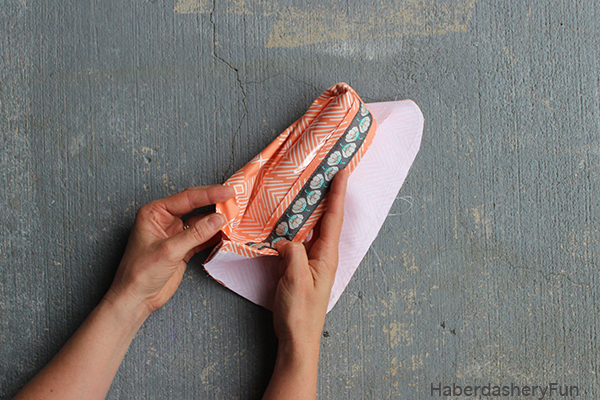 Use a small bit of fabric glue or Wonder Tape to help hold the fabric in place. 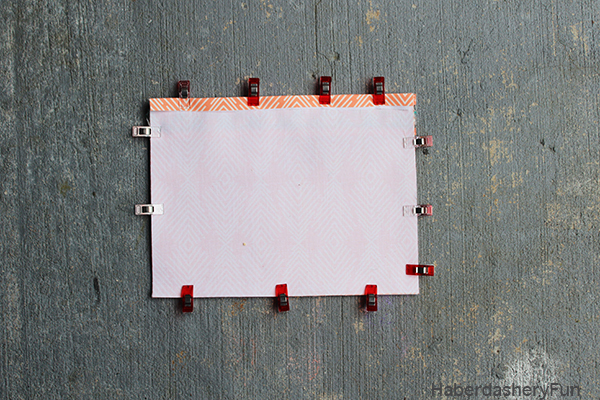 Turn over and place the other rectangle piece on the backside. Adjust so the front and back match up. Place into your sewing machine and edge stitch along the top and bottom edges. Step 2: Open the Velcro and lay the hook side along the back edge. Center. Sew in place. Lay the ribbon on the other side and center. Sew in place. The Velcro is slightly slimmer than the ribbon, so the stitch will be covered. Sew aside. Step 3: Lay the 2 rectangles measuring 10″W x 8″L on your work space. 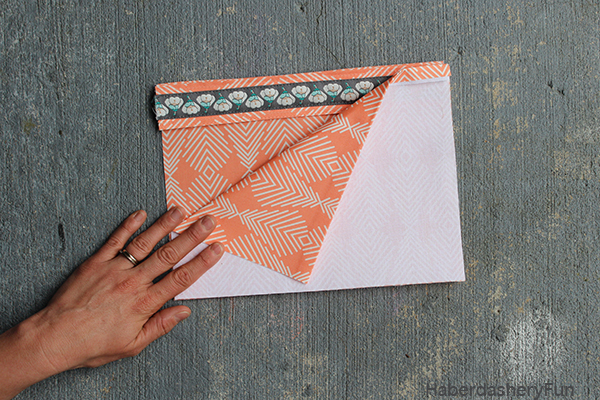 For each rectangle, turn and fold one of the 10″ edges under 1/2″. On the lining fabric, lay the loop side of the Velcro approximately 1/4″-3/8″ down from the top edge [ right side of the fabric]. NOTE: Before you sew the Velcro in place, make sure to match up with the hook/vinyl piece. Adjust if needed and sew in place. Step 4: Sandwich the 3 pieces in the following order – #1. Lining piece, Velcro/right side facing up. #2. Vinyl piece, Velcro facing the lining fabric. #3. Back piece on top of the vinyl, right side facing down. NOTE: Use wonder clips to hold together. 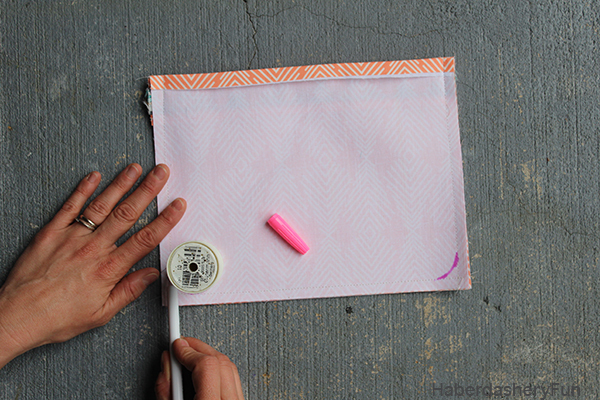 If you choose to pin, make sure to pin inside the seam allowance. Pins will leave holes in the vinyl, so pin carefully. Make sure all the top edges line up. 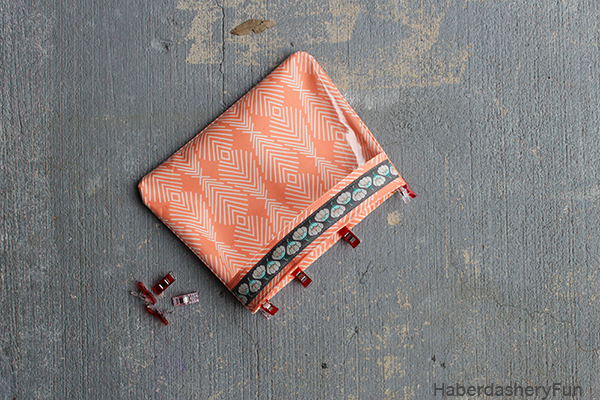 Place into your sewing machine and stitch the sides and bottom together with a 3/8″ seam allowance. Backstitch at the top edges. Step 5: Place the curve template [ spool in this case] at the bottom corners. Using a disappearing fabric ink pen, draw the curves. Place back into your sewing machine and stitch following the curves. 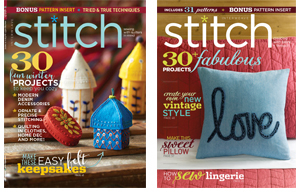 Remember to backstitch. 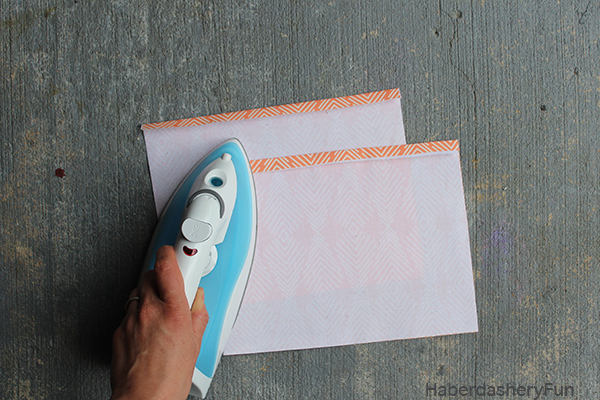 Trim off the excess fabric. Step 6: Turn right side out. Wiggle corners into place. Finger press along the outside edge to help lay the vinyl flat. 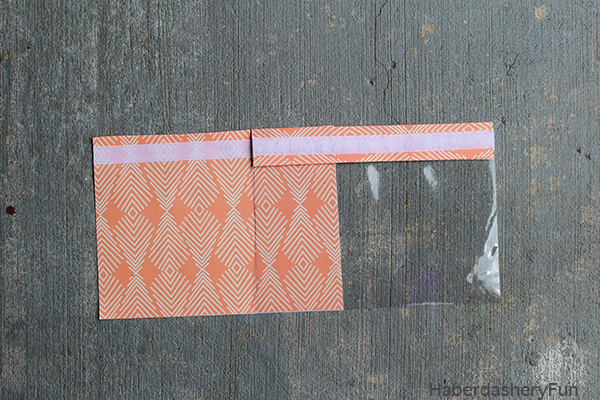 Step 7: Use Wonder Clips or pin the lining and back piece together at the top edge. Place into your sewing machine and stitch together, starting at one side seam. Backstitch at each side seams and/or continue and stitch around the entire top edge. So thats’ it. Fun right? What kind of combination would you make.. The same print or a mix of patterns and colors? 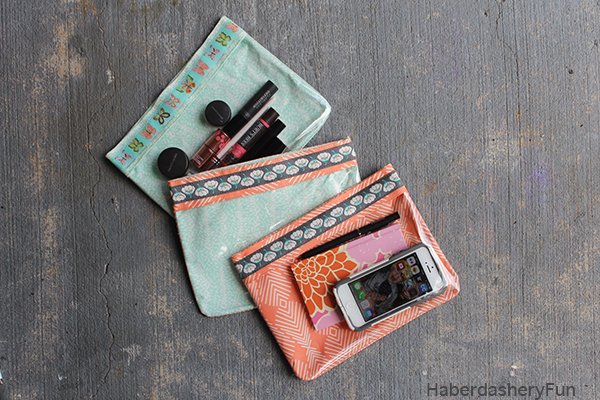 There are so many ways you can make this pouch. Please note that I was provided the ribbon and fabric for this post. All opinions are my own. Happy Sewing! I love these! It has been so much fun to see the variety of projects that everyone is making! I had a hard time cutting into my fabric and ribbon too! 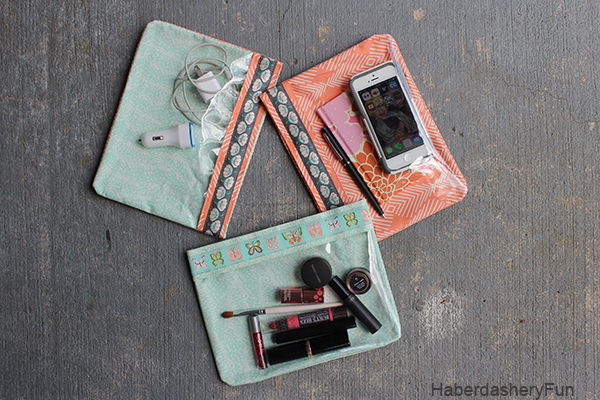 Love these little vinyl pouches, and I’ve sen wanting to sew with vinyl more. Thanks for the push and the tutorial! So cleaver, I want to make one of these! 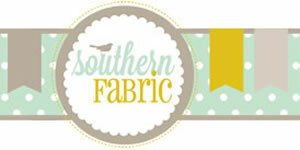 Such pretty ribbon and fabric! Love these cute little pouches, especially the fact that they’re see through. Thanks so much for sharing at Inspire Me Wednesday. 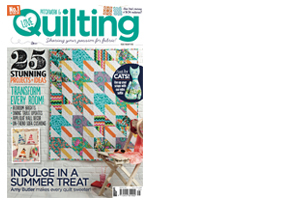 Featuring you in next week’s issue. Hi! I just stopped by from the Whatever Goes Wednesdays Link Party. Love this project. You’ve inspired me to try sewing with vinyl! 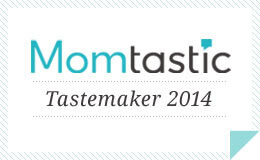 Hi Kathleen – thanks so much for stopping by. Let me know how it goes. these look so cute, I have tried to make things with vinyl in the past but they never turned out this nice. I’m encouraged to try again. Oh, I like these! I’ve never seen vinyl bags so pretty before. Which needle is used for sewing clear vinyl please? Well done tutorial. I appreciate that. 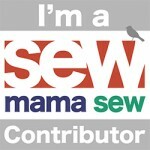 HI Lynda, So far, I’ve used a regular needle and thread for sewing with vinyl.. These are so cute! 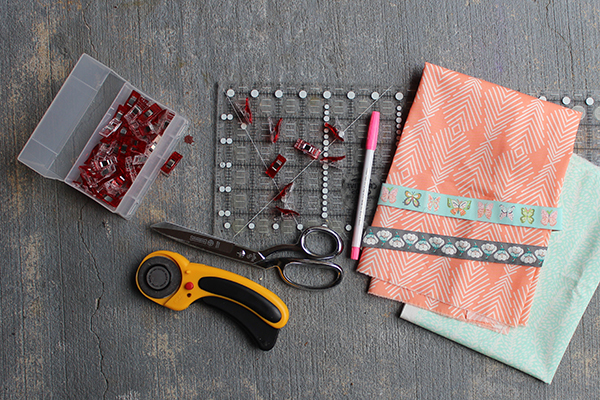 I’m always looking for easier sewing projects that my daughter might like to do together. She just got a new kids sewing machine and i think she would like this cute project. Thanks for sharing!